Flip Book Online is an innovative digital publishing solution that uses PDF-to-HTML5 conversion technology to turn your static PDF files into interactive HTML5 Flip Books, in just a few clicks. Go on, and create your Flip Book for FREE! Single-Page View: Open your Flip Book in an enlarged single-page view. Move around zoomed-in pages: Click, hold and drag around the zoomed-in page. Print book or selected Flip Book pages Option is enabled. Download PDF file: Download your Flip Book in .PDF format. Auto Flip option is enabled by clicking the "Auto Flip" button of the bottom bar. Easy Page Flipping: Using your mouse, click, hold and drag the page corners to flip pages. Sound of the flipping page enabled: With on & off options. With user-friendly buttons at the bottom of each page. With one click, using the user-friendly buttons at the bottom of each page. Simply enter the page number (page numbers are displayed throughout your Flip Book). Zoom on your preferred part of the Flip Book and scroll the page using the mouse wheel. Flip Book automatically detects mobile devices. (smartphone, iPhone, iPad, Android etc.). Owners of such devices will be able to view and use your Flip Book even without installing Flash Player. LotDOC flip book software can create multimedia flip books in HTML5 format for easy compatible with mobile devices. Videos, links, images, music etc. can all be viewed perfectly on iOS, Android, Windows etc. powered smartphones, tablets and more mobile devices with refreshing reading experience. HTML5 flip ebook requires no plugins like Adobe Flash when open it in browsers on mobile devices. LotDOC flip book creator can even generate stunning HTML5 page flipping ebooks from more types of documents including Microsoft Word, Excel, PowerPoint presentation. Anyone can convert a document to flipbooks in minutes without programming skills or CSS knowledge. 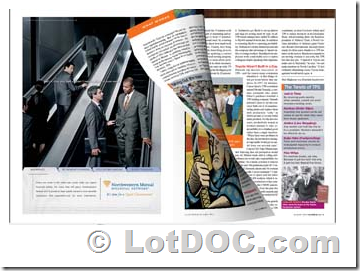 This feature stands out LotDOC from many other similar flipping book software.